In most cases, the use of pressure sensitive adhesives can eliminate mechanical fastening systems (staples, nails, or retaining clips) and the inherent problems associated with them, i.e., cost, weight and breakage. PSAs frequently improve productivity during the final assembly process by providing faster, more efficient way of attaching seals and gaskets to the end product.
. To what type of substrate will the PSA be attached?
. Will it come into contact with moisture or sunlight?
. Will the adhesive be functional after installation?
. Will the adhesive be in shear?
. What type of radius will the adhesive need to go around? A second consideration when specifying an adhesive is the question whether a rubber or acrylic based adhesive most appropriate for the application. Both types have a number of advantages. Rubber based adhesives are very thermoplastic. Exposed to heat will soften the adhesive and directly affect its performance. These types of adhesives have good initial tack to most substrates. This is unlike acrylics, which can take 48 to 72 hours to achieve their ultimate strength. 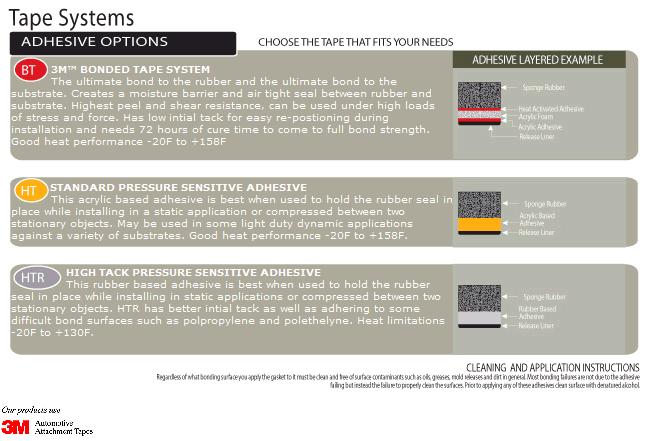 Advantages – The key advantages to rubber based adhesives are that they will adhere to a wide range of materials, they are generally very economical and they have a high initial “grab” or tack. Disadvantages – Some of the disadvantages include poor resistance to elevated temperatures, fair to poor resistance to chemicals, and generally poor resistance to ultraviolet light and oxidation. Acrylic based adhesives do not require as many additives as rubber based adhesives. In fact, the addition of other ingredients tends to detract from their strength. Acrylic adhesives are polar in nature, and tend to stick well to polar substrates such as metals, glass, polyesters, polycarbonates and neoprene's. If adhesion cannot be obtained to the satisfaction of the end user, a primer or treatment of the substrate’s surface may be useful. Conversely, acrylics do not bond well to non-polar surfaces such as polyethylene, polypropylene (olefins), EPDMs and silicone. In some instances, a primer may be used with acrylics to achieve a greater bond. Acrylics and thermoplastics by nature; they soften when exposed to heat and harden when cooled. They are formulated so that they are inherently soft at ambient temperatures. Being soft at room temperature permits them to flow under light pressure and make good intimate contact with the substrate. This ability to flow is very important when bonding to an irregular or rough surface. Acrylic adhesives can maintain cohesive and adhesive strength up to 350ºF (176.6ºC) and down to -50ºF (-45.5ºC) if a good, high-quality acrylic is employed in the application. Generally, acrylic and rubber based adhesives will resist non-polar solvents or chemicals (toluene, mineral spirits, gasoline, oil), depending on the severity of contact (concentration, duration and temperature). Acrylics age very well in the presence of ozone, ultraviolet light and corona due to the saturation in the polymer backbone. Advantages – Acrylic adhesives are cross-linkable and deliver good resistance to varying temperature ranges, chemicals, ultraviolet light ad oxidation. They are very color stable and can be easily removed and re-installed in the application if positioned incorrectly. Expensive than their rubber based counterparts, and the initial bond or tack strength is low.